Produce an 11 step monochromatic palette progressing from the lightest tint to the darkest shade, and use it to design a page featuring a monochromatic color scheme. In this first monochromatic assignment, the predominant graphic image must be a letter or number form. The letter can be from any language and may be repeated. A color scheme that includes only tints and shades of a single color. A tint is the lightening of a color by the addition of white. On a computer screen, the white comes from the background “white” color of the screen. We will tint colors by decreasing all of the other components of the color in relation to the white screen. A shade is the darkening of a color by the addition of black. On a computer screen, we shade a color by moving the black slider in the CMYK display. How do I make this 11 step palette? You use the CMYK (Cyan, Magenta, Yellow, Black) sliders in the Color Pallet to create the colors. In the gray scale, all the colors will be set to zero. Select the rectangle you wish to work with and type in the corresponding percentage of black from the chart above and hit enter. You can get an even progression in this manner without using any visual skills. To create the color side, start by reproducing just one of the rectangles and filling it with the color of your choice. (Start with a color that that contains no black or white. If you pick a sample in the rainbow Color Bar, pick one from the center of the bar (the equator). The ones at the top and bottom have already been tinted or shaded. Now move this first colored rectangle up and down next to the gray scale until you find the place where the light value of the color matches the light value of gray scale. This will be your middle value. 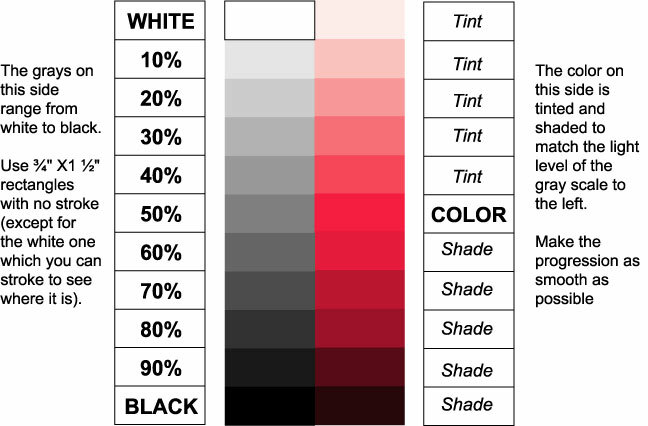 You will create “tints” of this color above this level and “shades” of this color below. Let’s do the tints first. Make a copy of the middle value rectangle you just worked with and place it in the open space above the middle value rectangle. With this new rectangle selected, hold down the SHIFT key and use the mouse to slide any of the color selectors a little to the left. Notice how all of the color sliders moved with the one you moved. This maintained the color proportion in the tint, and it happened because you held down the shift key. If you hadn’t, only one of the color sliders would have moved and the color would have changed. Try to match the light value in your new tint to the light value of the gray rectangle to the left of it. Now make a copy of your new tint, place it in the next space up, and tint it to match the gray scale. Keep this up until you reach the top slot. To make the shades, you make a copy of your middle value rectangle and move it down to the first open spot below your middle value rectangle. Leave the color sliders alone and move the black slider a little to the right. This will darken the color without changing its hue. Try to match the light value in your new shade to the light value of the gray rectangle to the left of it. Use this copying and darkening process repeatedly until you reach the bottom slot. How do I use this in producing my design? Select the whole thing and move it to a place on your screen that is outside the print area. As you create the shapes and lines that make up your monochromatic design, you can use the eyedropper tool to pick colors from the palette you just produced. The following information is excerpted from the Name & 3 Lines project many of you may be familiar with from Design 1 or 2. I have included it here to help those that have never used the Type Tool get started. You won’t need to type your name, but you will use the same tools in creating your letter. How do I write my name in there? Pull down the type menu from the top of the screen and choose font. Pick anything from the resulting menu to get started. Pull down the type menu again and choose size. Pick one of the larger preset sizes to get started. Click anywhere on the work surface. You will see an insert cursor where you clicked. Now click the selection tool to see your name as the selected object. How do I change the typeface? How do I change the size? Make sure your name is selected (you will see the base line and a small square at one end). Pull down the type menu and choose font. Then pick a new one from the resulting menus. You change the size by pulling down the same type menu and choosing size. You can use one of the preset point sizes, or click on other to bring up a dialog box in which you type in the size you want. (See your instructor for more advanced and exotic type changing tools once you have mastered the basics). How do I move things around? Click on the object you want to move. This selects the object. You will see its centerlines and anchor points. Now put the arrow on top of the selected object. Push down the left mouse button and hold it down while you drag the object to a new location. Then let up on the mouse button. You can also move selected objects small distances with the arrow keys on the keyboard. How do I turn the page on its side? Pull down the file menu and choose Document Setup. Now click the Print Setup button and choose the orientation you selected from the resulting dialog box and then click OK.
Click OK again in Document Setup and you will see the new orientation on the screen. How do I save what I’ve done? Place your Zip disk in the external Zip drive. Pull down the file menu and choose save. The first time you do this, the program will ask you what you want to call the saved file. The name highlighted in blue is the “default” name. Just start typing your name and the default name will disappear and be replaced by yours. When you have given the file a name and told the computer where to put it, click save. You don’t need this information to complete either of the monochrome projects. However, people with backgrounds in painting always ask about this after confronting the slider bars for the first time. So……, read on if you are interested. Alas,....this only works in Illustrator 9 (or earlier versions), in Illustrator 10 the tool was changed. How do I mix two colors, or gray them using the compliment? I don’t see anything in the slider bars that let me do this. Illustrator doesn’t have a way to mix colors with the slider bars, but it does have a neat way to accomplish that using one of the pathfinder filters. The resulting dialog box will give you an option to vary the rate of mix, just click “OK” for this demo. In Illustrator 10, "soft mix" was moved to the Effects pull down menu. In it's new form, it no longer creates separate filled shapes, and the objects affected must be grouped. Since the resulting color is not contained in an independent shape, it can't be sampled with the eyedropper tool.